A window for Knightlow CofE Primary School, Stretton-on-Dunsmore. I have already got all the kids drawing! A memorial window for Alton Castle – a Roman Catholic Discovery and Retreat Centre for 9-13 year-olds near Stoke-on-Trent. September 2013 - I am starting another evening course creating simple stained glass pieces in response to enquiries through this website! August 2013 - I am investigating an idea to use small pieces of glass in a ‘dalle de verre’ style rather than take them all to the dump! Watch this space . .
August 2013 - Visited the Eden Project in Cornwall – inspirational. July 2013 - We have built an earth oven in our garden as part of a community fund-raising event for St Francis Church, Bournville. We have had a lot of fun and it looks wonderful. July 2013 - You never know what will come up next . . vinyl window transfers in a ‘stained glass’ style. I have been asked to submit a proposal . . .
June 2013 - The Children’s Hospital Spirituality Day was very successful: we made 3D, table top, cardboard trees with little figures made out of jolly coloured pipe cleaners of the children and their family members and carers climbing all over them. These were made at the bedsides on the wards with the children and their parents. In the afternoon I visited the school and worked in batik with them. June 2013 - The Stained Glass Hen Party Workshop was a resounding success! Everybody cut a piece of glass as part of the design based on a heart and then edged them. I soldered them all together and the party moved on to their next venue, the bride taking with her a piece to hang in her window as a gift from all her friends and a memory to last. We had a great time! 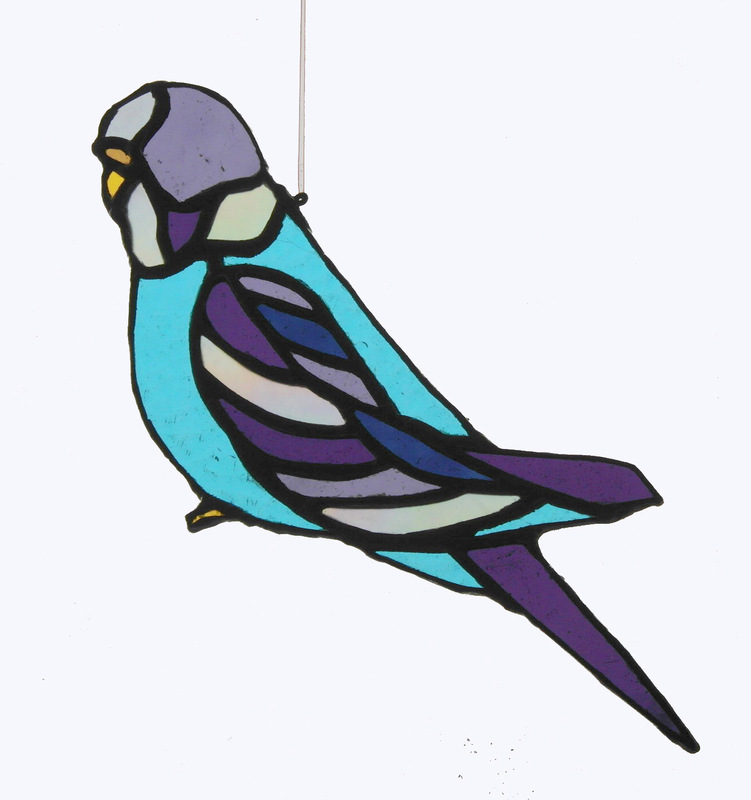 June 2013 - Another candidate is joining us to learn the art of stained glass making on Monday mornings in my studio. June 2013 - We won!! The recycled craft category in the ExtraCare Retirement Village Competition at New Oscott with our flying pink pigs and ‘spring’ lambs! A silver cup now joins last year’s trophy. We shall need a cabinet for them soon! May 2013- More enquiries from the Chaplaincy at Birmingham Children’s Hospital regarding their next Spirituality Day in June – a 3D ‘friendship tree’ to transport from ward to ward. April 2013 - I’ve been asked via this website to look into the possibility of running a Stained Glass Hen Party Workshop in June! It’s a great idea and I’m doing what I can to make it go. April 2013 - More crazy creations are beginning to take shape at New Oscott ExtraCare Retirement Village. We have been asked to enter the latest inter-village competition with an entry in the recycled craft category: ‘Create an pet animal and name it’. Finding this a little ‘ordinary’, for us, we are working together to create: ‘Old MacDonald had a PET farm’ with flying pink pigs complete with doily wings, and sheep on springs etc. etc. Quite sensible, really, when you come to think of it. 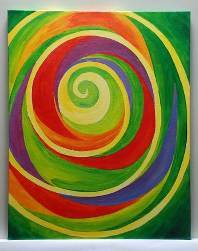 March 2013 – I have begun to explore working creatively with the Chaplaincy at Birmingham Children’s Hospital as they like my installation: Art and Soul – see below. As a taster I joined them on a Children’s Spirituality Day on 1st March looking at ‘The Elephant in the Room’ – things NOT spoken about but needing to be said, and ‘The Examin’ – observing what made us happy and sad in the day, with the ultimate idea of being reflective and enjoying the good things, whilst acknowledging and letting go of the bad things. 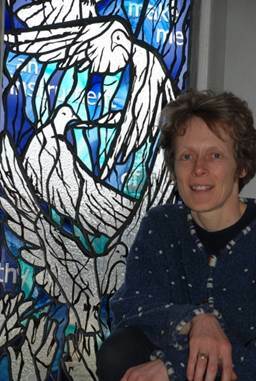 March 2013 - I have two more candidates wishing to learn the art of stained glass making! February 2013 - Imitation is the sincerest form of flattery! I have just been shown a tapestry of one of my window designs that has been produced ahead of the windows being made for the St James’-the-Great Church in Shirley, as part of their celebrations of this new development. It is very nice! January 2013 - I will be running course at Selly Manor in Bournville, Birmingham, entitled: ‘Glorious Light! An Introduction to Stained Glass’. It will run for six, two-hour sessions on Monday mornings beginning on 10th June and finishing on 15th July. If you are able - sign up with Selly Manor (not me) and I’ll see you there! November 2012 - Photos from the ‘Stained Glass’ event - provided by the school: Great fun was had by the kids and also by their parents who came along to help. The event was funded by the generosity of St James’ Church. September and October 2012 - Off to an Infants’ School for paper stained glass fun with playwright and education expert Ray Speakman. Our theme is Noah which links to the commission I have for St James-the-Great Church, Shirley, in Solihull. This is for NINE nave windows – the entire collection. The children are going to be making paper ‘stained glass’ animals over three sessions with excellent introductory activities from Ray. August 2012 - I have received a commission via this website for a private house. July 2012 - We’ve just won first prize for our entry – ‘The Mad Hatter’s Diamond Jubilee Tea Party’ at New Oscott. This ExtraCare Village ‘Creative Fun’ group has had a lot of fun with papier mache teapots becoming orbs and wooden spoons becoming sceptres! Art and Soul goes to St Martin's-in-the-Bullring in June and July 2012. The questions: How do I feel today? How do I react to life? What is the colour of my soul? The idea: To answer each of these questions in turn using the canvasses beneath, placing them up on the easel above and reflecting on yourself - as a whole - in a way which moves slowly inward using a method which is not common in life, but very soul-like in nature – colour. So said St. Francis of Assisi and this was the backdrop to the second Birmingham Cathedral Installation – Light in the Darkness - that I completed for October and November in 2010. 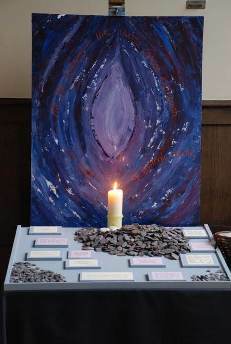 A table full of quotations about light and darkness were made available for people to chose from and place on the installation in front of the candle. A basket of slate pieces was available for people to record the name of someone and add it to the rest amidst the quotations. People could also record their own light and dark experiences if they wished. The candle burnt for two months and then the installation moved across to St. Martins-in-the-Bullring, also in Birmingham city centre, for a further month and a half until mid January 2011.